A qualitative study shows how deeply important familylike relationships are to long term care clients in adjusting to and enjoying their residences with a sense of dignity, security, and belonging. Because "there is no place like home," the best long term care communities offer a new home and bonds based on affection for many older adults. Given the risk for social isolation and complications of chronic illness, the need for quality long term care will likely grow as the population ages. In long term care communities, strangers can become friends, if not extended family. Social workers can help residents cultivate meaningful relationships and the conditions for others to do the same, but with an awareness that the creation of relationships must always be a delicate balance between involvement and detachment. The midpoint of that balance may vary depending on the situation and setting. Getting it right can influence the well-being of both the client and social worker. Spiritually sensitive social work has been described as an awareness of how one's relationship with the self and those outside of the self, including the environment and/or higher power, enhances life meaning. Spiritually sensitive social work is also a process of cultivating relationships, such as the therapeutic relationship, that enhance life meaning (Callahan, 2013, 2017a, 2017b). Relational spirituality is considered a product of spiritually sensitive relationships where clients, and potentially the social worker, have an experience of enhanced life meaning (Faver, 2004; Callahan, 2013). Relational spirituality can be viewed as a strength, if not an opportunity to grow through social work practice. The ecological systems theory suggests that relationships across systems can be meaningful, while goodness of fit points to which systems can support a more spiritually sensitive environment. The results of a study for Abbeyfield, a British charity with 570 housing projects and residential care homes in the United Kingdom, casts new light on the spiritual significance of relationships for older adults in long term care. The study's nomenclature will be reviewed first, to clarify how it relates to long term care in America, as the terms used in the United Kingdom are somewhat different. Long term care staff are referred to as "care workers" or "carers" who parallel the role of personal care assistants or certified nursing assistants, while "house managers" are supervisors who, to some extent, engage in care coordination, a role often assumed by social workers. "Care homes" are houses where older people have their own bedrooms and share community rooms, with carers and a house manager present during the day. This is in contrast to independent living apartments that are more common in America. Despite our differences in long term care, the spiritual significance of relationships remains and has implications for social work practice. The study involved over 100 in-depth semistructured interviews in more than 40 different care homes and assisted living sites, which were conducted by Kartupelis, who engaged in "listening with purpose but without purposes" (Woodward & Kartupelis, 2018). Respondents were care workers, elder residents, volunteers, and managers, and the aim was to understand how people felt about their lives and what was happening around them that affected those feelings. What helps people to feel loved, known, and valued as individuals, secure in their lives and at peace insofar as is possible for them? What really matters to staff and residents? Responses were transcribed and coded thematically. The full details of this study can be found in Developing a Relational Model of Care for Older People: Creating Environments for Shared Living by Woodward and Kartupelis, but the study is summarized here as it relates to social work practice in long term care communities. This study suggests that for residents in care homes the most positive feelings centered around both creating a "family" and living in a "home." Kartupelis observed that almost every person interviewed described their home as it related to the experience of "family bonds," while some further acknowledged, "We are a family, and we support each other." They expressed a value for relationships "that they would never have had on their own" and were considered "like another family." Residents recognized that sometimes there were disagreements that required staff assistance to support resolution. This formation of "family" bonds and other meaningful relationships gave residents a great sense of support and security, and hence underpinned the spiritual health of staff and residents, engendering respect and a way of treating people with compassion without patronizing them. These relationships appeared to be mutual, two-way relationships that carers likewise described as "emotionally enriching." The environment appeared to strongly influence the potential for residents to feel a sense of dignity, security, and belonging. No one wanted to live in a care home that looked like a hospital or hotel; they wanted somewhere to belong. Residents seemed happier when they did not have to uproot themselves from friends and their community to receive long term care. Residents who lived in small towns and more rural areas were likely to select care homes close by. This increased the potential that they would be visited or taken out by friends as well as family. Views of the local town or countryside helped them keep that sense of connection and continuity. A variety of sitting areas with books, pictures, and ornaments that people used to decorate their space was important, and it was essential to have at least one sitting area that was not dominated by a television. One volunteer said, "I used to run the film show. … One afternoon I went 'round and the television set wouldn't work. I was playing with the television set trying to make it work. … [I] was sitting on the floor by the television and stayed there for the next three-quarters of an hour just chatting. At the end I said, 'Sorry about that, I'm very sorry about the film show,' and one woman said, 'Doesn't matter, we've enjoyed sitting here and having a good blather.'" Gardens also played important roles in the life of a home such as encouraging mobility, providing a connection into nature, and offering extra space. It was observed that "gardens that are laid out with thought—offering, for example, summerhouses, statues, water features, easy-to-follow paths, raised flowerbeds, and fruit trees—can be used as extensions of the communal space"; this includes outside breakfasts and teas in good weather. One manager said that the garden was of "great emotional significance" for residents. Good, enjoyable nutrition was also described as being transformative, and daily meals brought people together and provided a structure to life. One resident said, "We sit down together and it makes us a family again," a sentiment echoed by another resident who said, "I love joining in with the meals," and another resident who said "being able to eat delicious things" was the most life transforming. In creating the environment for a "family home," privacy and quiet times were needed for both residents and carers. Quiet spaces, such as a small retreat room, corner of a garden, or temporarily empty room, allowed carers to be alone when they needed a break. A positive atmosphere supported engagement rather than leading carers to "hide" behind a closed office door or mounds of paperwork. One manager said, "Sometimes she [the cleaner] gets stuck in a room for a long time, which is a good thing, because they're chatting, so she gets feedback, and she'll say [to me], 'What's wrong with so-and-so today? She seems a bit down.' So cleaning goes out of the window, but you've supported someone." Protecting boundaries and personal space was linked to the way in which care workers saw their status in the home. Staff who talked about status issues seemed divided: They felt themselves to be part of a family in terms of daily relationships, yet some also spoke of respecting the "home" of residents and of being "visitors" in it. Meaning in life—vitally important to contentment and health for most people—was found not only in favored pursuits but most importantly in relationships with other people (and pets). This involved a mutuality in that most residents wanted to actively contribute to daily life by taking on tasks (eg, helping others, setting the table) or roles (eg, the person who opens the door to visitors), but primarily through an interest in the lives of others in the community and in loving responses to those they perceived to be anxious or in need. Through these relationships, residents could experience the joy of informal caregiving. When asked what helped people to feel more content, one house manager explained, "I think if they're able to do something, to help one another … it's their home, but they have to be part of the home as well." She spoke of a woman who liked to clear the table, and a man who did the weeding in the summer. These quotes begin to describe how the environment provided the conditions necessary for meaningful relationships with the self and those outside of the self. Older people often felt alone and vulnerable in their previous home, so safety and security were enormously important in providing a base from which to regain confidence upon moving into a care home and responding to the need to forge new connections. Security meant both physical safety and the security of established relationships, such that the same carers were seen and known on a daily basis. It was observed that the three most important things to residents were "security, companionship, good food—but of the three, security" is what mattered the most. The building of meaningful relationships entailed carers who were willing to listen to residents as well as provide a consistent presence and allow time for trusting relationships to grow. This included a respect for a resident's right to privacy and freedom to choose with whom and how much to share. Overall, this study revealed an important truth: loving company, offered during the course of the day, brings meaning, joy, and security to life. The goal of social work in long term care is to maintain a focus on the holistic well-being of residents for optimum quality of life. Older adults are part of this shared endeavor and, in the classic sense, companions: sharers of the daily bread. 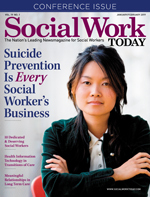 The danger is that social workers are seen as uncaring when time taken to nurture relationships becomes secondary to other job demands or avoided due to discomfort in managing potential for dual boundaries and compassion fatigue. This does not mean that relational boundaries should be compromised but should be drawn with a light touch that enables social workers to maintain their personal lives without feeling the need to hide them from view when at work. For example, in one care home, the house manager was soon getting married, and both she and the residents were clearly enjoying sharing photos of the dress and talking about past weddings. The bonds of affection were visible, but this did not imply that the manager or other staff was incapable of acting professionally and guarding confidences as necessary. Good training, professional guidelines, and supervision can provide social work support. Social workers can maintain professionalism and carry on calmly with tasks while also feeling deeply affected by the loss or distress of an older person they may see as a "mum" (one house manager said, "I look on my work as having 12 mums here"). The mutual support of relationships that emerge in the home can offset emotional stress, but caring is unlikely to be rewarding unless there is a level of "knowing and being known" that goes hand in hand with the sorrow of loss. It also leads to being more alert to the experience of a coworker who might need additional support after an intense encounter with a resident. In Kartupelis and Woodward (2018), Kartupelis gives the following snapshot entitled "An Empty Bench": "Rose, the manager of the home, is showing me around the garden courtyard onto which all the residents' rooms open. The French windows of some are ajar to let in the morning, others still closed and curtained. One has its windows wide open, and furniture is being moved out. The woman who lived there died recently, and her rooms are being made ready for another. I ask Rose how people cope when they lose one of the community—and, in particular, how does she cope? She answers that it's part of life: 'I don't really mourn. It's to be expected; the average age here is 94. I won't say no one feels it—of course they do—but I carry on and think of the next person who will be here. We appreciate the fruit trees already offering their apples to people and wasps alike.' Rose indicates a particular wooden bench. 'She loved sitting there,' she says, and unobtrusively finds her handkerchief." This study also suggests the importance of reflecting on the point at which life quality necessitates long term care. The concept of "independence" is often equated with dignity and autonomy, and therefore an unqualified good. Yet the outcomes can be far from dignified, with rushed visits to the doctor, limited access to healthy meals, unreliable assistance with toileting, and great stretches of loneliness if family is distant, neighbors are out at work, or old friends are immobile in their own homes. Residential care is often delayed for so long that older adults have limited energy or ability to form new friendships or adapt to the environment. In the end, long term care communities are essential as people age, but the answer is not to corral people in daily activities. There needs to be opportunities for authentic, mutual engagement to the extent that residents can and desire them. The formation of meaningful relationships is also supported by an environment that allows residents (and staff) to experience comfort, personal choice, and privacy. Social work intervention can be instrumental in cultivating this spiritually sensitive environment. It starts with a heightened awareness of how relationships, including the therapeutic relationship, contribute to a resident's experience of life meaning. Although it takes more than clicking your heels, social workers can help older adults draw strength from meaningful relationships that emerge in long term care communities to make their house a home. — Ann M. Callahan, PhD, LCSW, is an associate professor in the social work program at Eastern Kentucky University. — Jenny Kartupelis, MBE, is a director of faith in society and a fellow of the faith and civil society unit at Goldsmiths, University of London. Callahan, A. M. (2013). A relational model for spiritually-sensitive hospice care. Journal of Social Work in End-of-Life & Palliative Care, 9(2-3), 158-179. Callahan, A. M. (2017a, February). Relational spirituality. Social Work Today. Retrieved from http://www.socialworktoday.com/archive/exc_0217.shtml. Callahan, A. M. (2017b). Spirituality and hospice social work. New York, NY: Columbia University Press. Faver, C. A. (2004). Relational spirituality and social caregiving. Social Work, 49(2), 241-249. Woodward, J., & Kartupelis, J. (2018). Developing a relational model of care for older people: Creating environments for shared living. London, England: Jessica Kingsley Publishers.